This Vegan Sopa de Fideo is pure Mexican Comfort food. It literally translates to Soup of Noodles, so think homemade Tomato Soup – with noodles of course. It can be made very easily without oil, and comes together in minutes for a quick and hearty meal. I honestly had never heard of this soup, even after living in New Mexico for 10 years. So a huge thanks to my favorite YouTube chef, Sam the Cooking Guy for introducing me. As I’m watching his show I’m thinking, “Wow, this looks easy” and, “I bet I can totally make that without oil”. So I did….and it was AWESOME. Traditionally, the noodles (Fideo) are browned in oil, because browning the pasta adds a whole new level of flavor. But instead of reaching for a bottle of olive oil (which I don’t own anyway), I reached for my baking sheet and turned on my toaster oven. No oil, no parchment paper, no extra pan – just a baking sheet and a 350° oven and in 10 minutes I had perfectly browned noodles. As for the soup you’ll need some canned tomatoes, a few cloves of garlic, an onion, and a few spices. This soup reminds me of those little cans of Chef Boy R Dee I loved so much when I was growing up, remember those? Like I said – pure comfort food, and I bet your kids are going to love it! Noodles: I went to the Mexican section of my grocery store and found little 7 oz bags of noodles that say “Fideo”. If you can’t find them, you can also use vermicelli, angel hair, or even plain spaghetti that has been broken into small 1″ long pieces. You’ll need about 7 oz of noodles. Note: These noodles are plain white pasta but I’m sure it would work with whole wheat or maybe even GF as well. Tomatoes: For the tomatoes I bought a 28 oz can of whole, peeled San Marzano Tomatoes. These are seriously some of the best tomatoes I have ever tasted from a can and I highly recommend them. Spread your pasta out on a dry baking sheet and toast in a 350° oven for 10 minutes. The pasta will begin to brown quickly so watch to make sure it doesn’t burn. I used my toaster oven and it worked perfectly. Meanwhile, dice a medium-sized onion and add it to a large soup pan. Saute onion in a 1-2 tablespoons of veg broth until softened. Season the onion with 1 tsp Mexican Oregano, ½ tsp Cumin, and ½ tsp Chili Powder. Toss in 2-3 cloves of minced garlic and stir for 30 seconds or so, just until it becomes fragrant. Add in a 28 oz can of whole, peeled tomatoes (juice and all), and stir to mix. Simmer for a few minutes and prepare to blend. I use an immersion blender. They are handy little devices and I have a few I recommend in my Amazon Store. You can also do it the old-fashioned way with a regular blender. Process until smooth and then return the soup to the pan. Add 3 cups of Low Sodium Vegetable Broth and stir to mix. Finally, add your noodles and bring the heat up. Let that simmer for 20 minutes or until the noodles have softened. Add salt and pepper to taste, and serve. I love a little Cilantro for garnish, and a few chopped green onions too. You could also add Avocado or my Green Chile Sour Cream. I’ll be anxiously waiting to hear what you all think, so please keep me in the loop. Next up – I’ll be continuing my Mexican theme by making homemade Tamales. 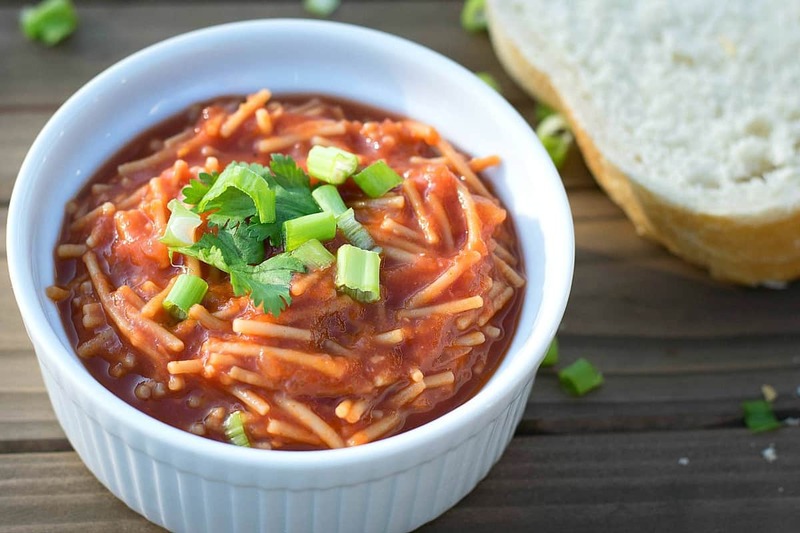 This Vegan Sopa de Fideo is pure Mexican Comfort Food. Think homemade Tomato Soup - with noodles. It comes together in minutes for a quick and hearty meal. Toast pasta in a dry baking pan at 350 degrees for 10 minutes, or until browned. Dice onion and add to a large soup pan. Saute in 1-2 Tbs Veg Broth until softened. Add Oregano, Cumin, Chili Powder, and minced Garlic and stir until fragant. About 30 seconds. Add Tomatoes with juice and stir to mix. Simmer for a minute or so and then blend entire contents of pan either in a regular blender, or with an Immersion Blender. Add broth and stir to mix, then add noodles. Simmer for 20 minutes, stirring occasionally, until noodles have softened. Garnish with fresh Cilantro, chopped Green Onions, or Avocado. I love Mexican food and am excited to find yummy wfpb recipes to try out. I will be trying this this weekend. And I can’t wait for the tamale recipe!! Chuck, Chuck, Chuck, another fabulous recipe! I am home alone this evening, so I whipped this up for me. Love it! So tasty! The San Marzano tomatoes rock. I made it with ww spaghetti and it is yummy. Definitely will be making this again. Thanks! I know I have mentioned this before but I love Sam! Been a long time viewer/fan. There you go again! Already made it twice, and I am not a soup lover! Thank you! Fast and tasty! Just made this. It’s yummy and so very easy to put together. I found the Fideo noodles, so I made your recipe exactly as written. I will definitely make it again! Thanks for another great recipe. Very good and so quick and easy, especially since I didn’t toast the pasta. Thank you! I LOVE fideo soup, and I used to buy those cheap Knorr Fideo soup packets (with very questionable ingredients). This recipe is wonderful, and I’m actually eating it cold for breakfast as I type this! Will be making again, and often. I am making this right now, it isn’t quite done but from a taste test I can tell it is going to be delicious. I had to do a few tweaks based on what I have in the house, they don’t have fideo noodles here but they have Turkish and Asian soup vermicelli that appear to be identical. I used two roughly 12oz cartons of oil free tomatoes with garlic and chilli, and to make up the shortfall an oil and salt free pasta sauce with mostly oregano in it. For the broth I used Knorr UK’s professional vegan and oil free bouillion jelly and used half the amount suggested for the amount of water.